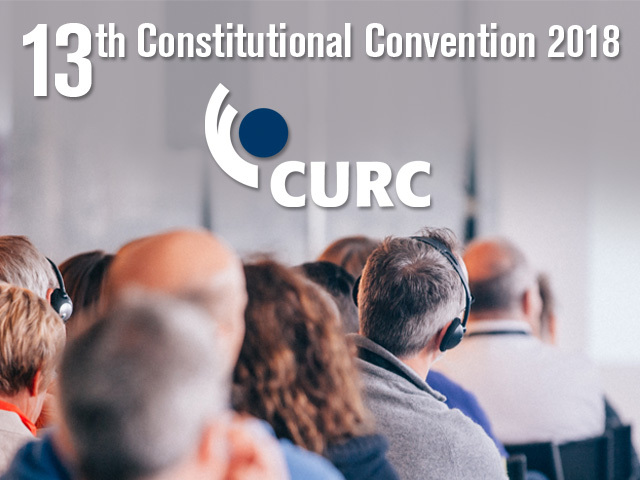 The 13th CURC Constitutional Convention will be held in Toronto, Ontario from the evening of September 19 to noon on September 21. Please refer to the appropriate documents below for details. We hope that many of you will be joining us. September 18, 2018: CURC President Len Hope has issued a pre-convention press release. Click here for a PDF of the release. Or view the press release on CURC’s News page here. The room reservations for the CURC Convention at the convention rate are now closed. However, delegate registrations and meal requests are still open and being accepted. We are proud to announce that Scott Duvall, NDP MP for Hamilton Mountain, will be the guest speaker at the gala dinner of the Convention on Thursday, September 20 at 7 pm. Tickets are $70 a person and must be reserved and paid by September 12, 2018. Click here for more details, and to arrange your reservation. We need your help for a successful Convention! CURC is seeking your help, where you can, for financial support, prize draw item, and swag for the delegate kits for the upcoming Convention. As you can understand in this economy running a convention is quite expensive. We are hoping to get your financial support. No donation is too big or too small. Anything would be much appreciated. Some areas you might consider is subsidizing a coffee break, the wine for the gala dinner, reception before the panel discussion on the Wednesday night, just to name a few. At every CURC convention there is a prize draw, and we are looking for some ticket items for the draw as well. We are also looking for swag to place in the delegate kits. This offers you the opportunity to promote your organization.For more details, please see this appeal from CURC President Len Hope.